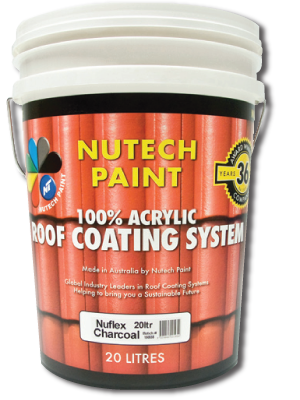 Nutech Paint has developed a Proven system for Restoring Asphalt Shingle Roofs. Consisting of a three coat process; one coat of our Nutech Asphalt Primer formulated specifically for Asphalt Shingle Roofs, followed by two coats of NXT Cool Coat or Tileflex. Nutech Paint’s Asphalt Shingle Primer is designed to seal and adhere the rough and some times loose granular texture of Asphalt coated Shingles, shakes, cap sheets and liquid asphalt / bitumen coated roof structures. Our asphalt shingle restoration primer resist asphalt bleed through and top coat blistering to ensure the best top coat finish possible. With NXT Cool Coat Matte, your Asphalt Shingles will not only be brought back to life with a new vibrant color but with a couple of added benefit they never had before. Your newly coated asphalt shingles will be utilizing Nutech Paint’s Nanotechnology that repels water, dirt, mold and algae, prolonging the life of your asphalt shingle roof. 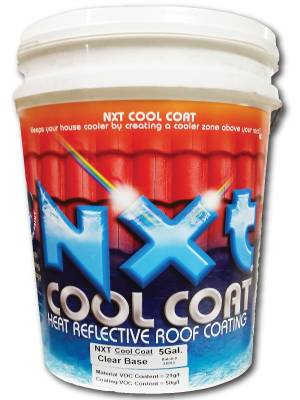 NXT Cool Coat’s Heat Reflective properties will keep your home naturally cooler and will save you on cooling costs by reflecting light, not allowing heat to radiate into your home.